We care about the story that our Members and their customers tell about INUKA. Our products are of the highest quality, affordable and a happy sell to make it possible for all to enjoy a lasting fragrance experience. That’s why we say, INUKA, Always with You. Instead of selling products in a retail store, INUKA, with its network marketing structure, offers individuals the opportunity to share in the income and profits associated with sales volume. Our vision is to create a platform for anyone seeking to obtain financial independence to supplement, replace or exceed their current income - embracing the part-time sales person and the more serious career builder. With INUKA, anyone can start their own business and share in our top-quality products, rewarding earnings and compensation plan. The INUKA Compensation Plan rewards our business entrepreneurs for selling products and for promoting the INUKA Business Opportunity. INUKA offers 6 Ways to earn and benefit, including monthly volume rebates up to 16% on personal and group sales value (up to 4 levels deep), depending on monthly productivity. The INUKA Business Opportunity requires no registration cost or major investment, other than samples of the products and an INUKA Kit also known as a Business Kit. What sets INUKA apart to be a company with a difference is our mission is to create an environment where our entrepreneurs will feel at home, valued and part of our INUKA Family. A place to grow as a person while we offer free training, ongoing support and encourage you to work towards a better tomorrow and to share in your triumphs and challenges. 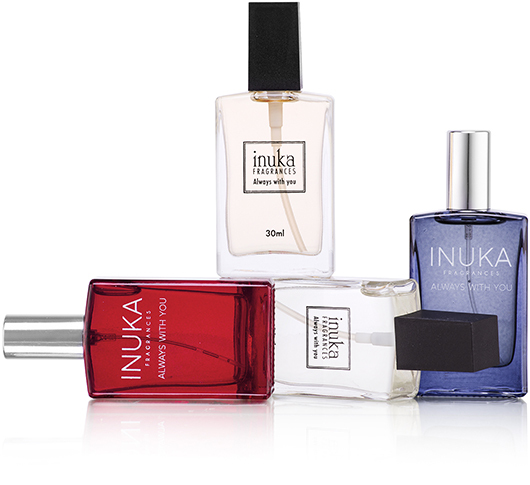 There are 5 kits to choose from when joining INUKA that offers exceptional value. INUKA Business Kits include a variety of our top selling products and all the business tools you need to launch your new INUKA Business. Submit it together with the proof of payment to orders@inuka.co.za. Use your name and cellphone number as reference when making your deposit. Review the INUKA Senior Status and Beyond Business Guide that will be included with your Business Kit, explaining the business terminology and compensation plan. All Business kits include the "Business in a Box" Tool Pack valued at R 500. This includes the INUKA Business Guide, 18 Samples (12 x 4ml Perfume Samples, 4 x 10ml Lotion Samples and 2 x 4ml Tissue Oil Samples), INUKA Kit Bag, 40 Brochures, 10 Order Forms, 10 Registration Forms, 20 Perfume Testing Strips, 20 Business Cards, 10 Branded Clear Gift Bags, Genealogy Chart, Coffee Beans, INUKA Pen and Colour Stay Nail Polish Chart.